Since the announcement of the signing of teenage afrobeats artiste, Rema, to Mavin Records and the release of his 4-track E.P, there has been suggestions by a lot of people that he is the future of Nigerian music. Since his intorduction to the music scene, in a very short space, he’s already created his own fan base with his song; “Dumebi” doing fairly well and piercing through the hearts of young music fans. However of all the stories surrounding Rema, the most significant and widely spread is the fact that people say he sounds like wizkid. Although he has so far downplayed the thoughts as he said it is Wizkid who sounds like him instead. 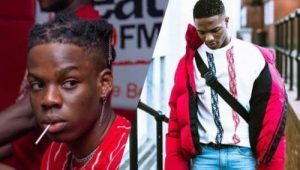 Many people have received Rema’s claims of Wizkid sounding like him as an arrogant claim and therefore that he wouldn’t be a successful artiste, while others believe there is nothing weird in his claims as he is only confident of his talent. They even said, he will be successful and infact he would be as big as Wizkid. Therefore, the last sentence now creates the question, will Rema ever be as big as Wizkid?? ?